4th July, 2014, 27000 pigeons are released in Barcelona in the biggest event in the pigeon racing calendar. John Halstead from Nyland near Stalbridge in North Dorset knows what it's like to win; his bird Untouchable came home first in 2009. Here he tells BBC Radio Solent's Steve Harris about how he got into pigeon fancying, and what it takes to breed a winner. INFPA - 2014 European Ententee Registered Rings. 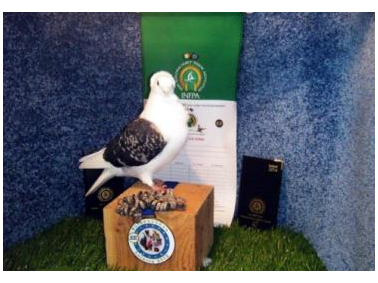 The Irish National Fancy Pigeon Association is now taking orders for our 2014 European Ententee Registered Rings. Our rings are the only EE registered rings for Fancy pigeons in the whole of Ireland. Our Irish rings are available for all breeds from sizes A (7mm) to F (12mm). Also our Irish rings have their own unique serial number, which is registered in the INFPA data base. Available to fanciers all over Ireland. Go to the INFPA website now for a Ring Order Form and more information or you can contact our Ring Secretary, on the phone number or email below. 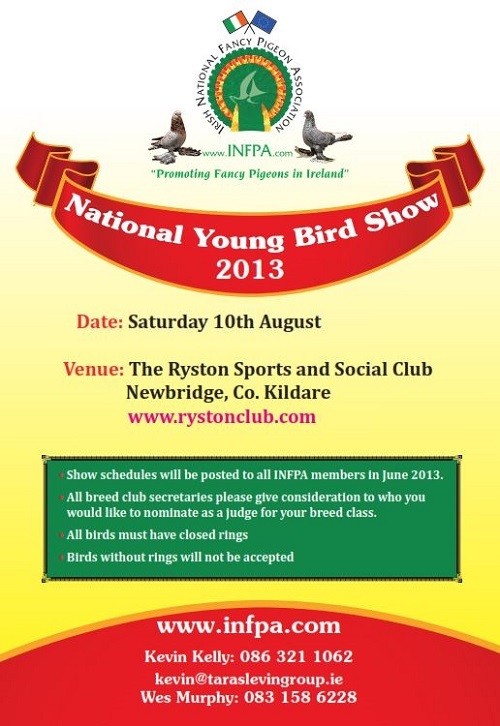 Show schedules will be posted to all INFPA members in June 2013. All breed club secretaries please give consideration to who you would like to nominate as a judge for your breed class. The Limerick Tumbler Club News. The Limerick Tumbler Club 10th Anniversary. The Limerick Tumbler Club Show 2012. Here are the show results for The Limerick Tumbler Club Show 2012. Congratulations to The Limerick Tumbler at Leipzig Show 2012. What is www.pigeonMad.com all about? Welcome to Pigeonmad.com the new web site to buy and sell anything to do with pigeons, small birds, fancy pigeons, etc. Place your free ad - from lofts to feeders and anything in between. It is free and easy to place an ad on pigeonmad.com. Send us an email to freeads@Pigeonmad.com with your free ad. Send us a regular text message to 086 151 0231. This is an O2 number and no additional charges. Just like texting a mate. When sending us an ad, please include a title, description, cost and contact details. If you have a picture, send that along too. Founded by pigeon mad fanciers for pigeon mad fanciers. You have to register to place an ad or chat, but it’s free! Pet shops or pigeon supply shops can email us for free ads.